A ski resort that’s only open in summer? In the northern hemisphere? Yes, that’s Fonna in Norway. And you can arrive by boat… it’s just a half hour from a magnificent fjord. Fonna Glacier Ski Resorts is very cool, literally – located on the northernmost of four glaciers in Foglefonna National Park in western Norway along the Hardanger Fjord. Folgefonna is the most southerly Norway glacier- and the 3rd largest largest. 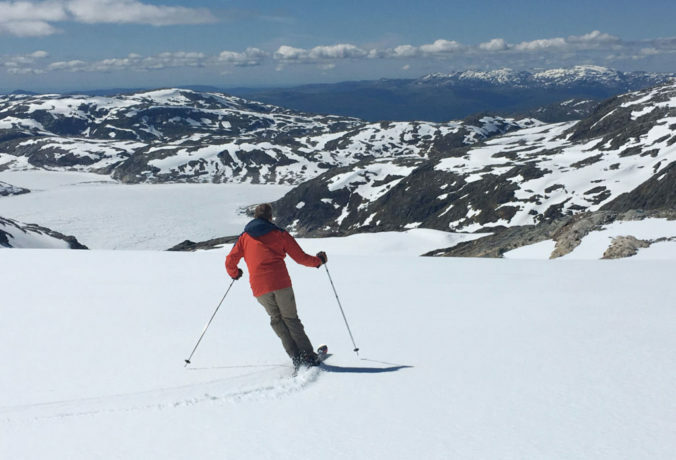 Summer skiing on a glacier is amazing, at this high alpine winter wonderland with brilliant sea views of Norway. Fonna is not a big ski area, especially by Europe’s Alps standards, it’s just one T-Bar serving four wide trails and several terrain parks. Fonna’s ski slopes are not particularly steep either – its intermediate terrain. The most black diamond aspect of Fonna is the road up to the glacier. Its a 16-km bus ride to Fonna Glacier ski resort, a one lane road with crazy hairpins turns, climbing swiftly from sea level up 3,900 vertical feet. Take the ski bus from Jondal, which makes one trip a day from the ferry docks at 9:50am ( so you can boat and ski in the same day). Let the expert bus drivers steer while you enjoy the scenery of rivers and waterfalls, pastoral farms with grazing sheep, then massive boulders and cairns balancing on huge granite slabs. Fonna is closed in winter because of this precarious road and the 30+ feet of snow pack received during the cold dark winter in Norway. Fonna Ski Resort opens mid-June through mid-August – that’s when the best glacier skiing occurs and it also allow the town of Jondal to share the same bus for skiing as for the school kids September to June (a quite luxurious bus for children, with panoramic windows). Fonna’s spectacular mountain road ends in a small parking lot by the glacier, where you find Fonna’s humble facilities – two 1970’s vintage chalet buildings. The first hut sells lift tickets ($390 krone for the day) and rents skis, boards, boots, poles, helmets – everything you need to ski if you arrived by boat. Fonna’s modest lodge serves home cooked food cafeteria style and restrooms. Picnic tables outside are the best seat in the house on a clear day. Visit Fonna on a blue sky day – it’s all about the view, and a picnic outside to truly savor the setting. 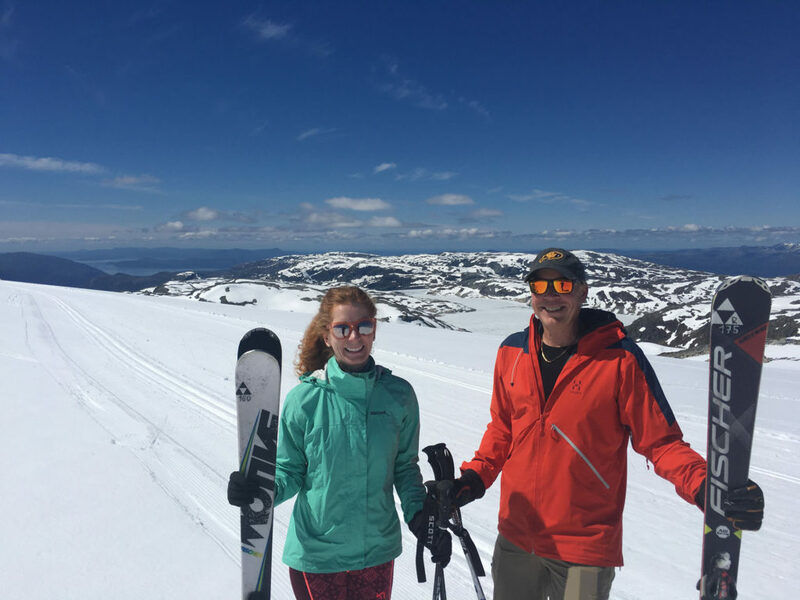 We had a perfect blue-sky ski day at Fonna in late June, with a fresh dusting of sparkling snow on top of perfect groomed corduroy. Fonna’s T-Bar is the only lift – intentional to withstand the ice movement on the glacier, it climbs efficiently up 800’ vertical. Fonna’s trails are very wide, moderately pitched, and well-groomed, even salted to harden the snow from melting on warm summer days. Fonna skiing can get busy with alpine race teams training from Scandinavia and Eastern Europe. But the alpine racers are relegated to one big trail, training in several courses with gates side by side. The majority of other skiers and snowboarders hit Fonna’s terrain parks. That leaves the other ski routes on the wide open glacial plateau to us. Fonna also offers 5 km of Nordic groomed trails above the alpine skiing on the plateau. 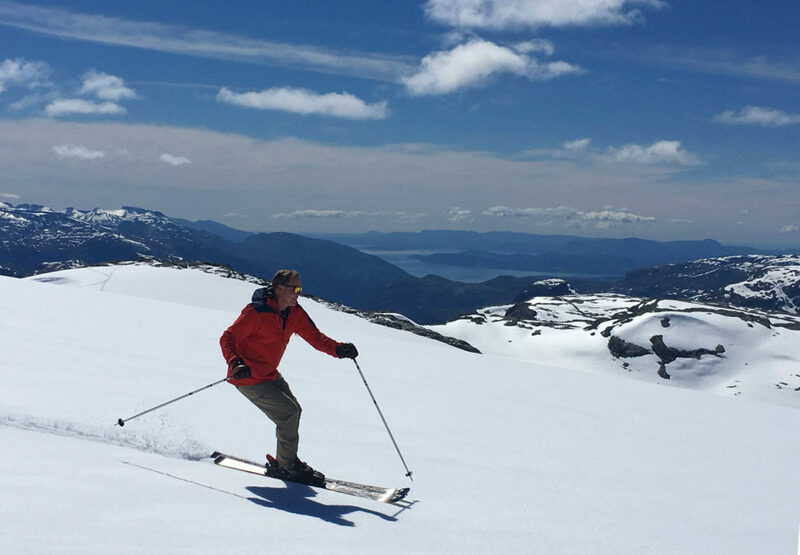 We made a short climb from atop the T Bar to the cross-country terrain and scored a few beautiful off-piste turns and even better views of Hardanger Fjord and the North Sea. Your panorama from Fonna is striking blue water below and lush green mountains in contrast to the white wintery glacier. You can see Rosendal’s towering Alps and the North Sea in the distance. For non-skiers, guided glacier tours depart from Fonna’s base lodge. Sunscreen is a must, beware the sun’s refraction from the snow at high elevation even though it feels cool on your face. Dress in layers for glacier skiing, its winter-like and very exposed, but you can be blessed with intense sun and summer temperatures. We skied 14 laps on the glacier, with a few stops for water in the lodge and a picnic of Norwegian cheese, smoked fish and fruit. The only bus back to Jondal is 3:50pm, get a front seat as the descent is as stunning as the ride up. We were back to town, on our charter sailboat in Jondal harbor by 4:30, for drinks at Hardangerfjord Lodge overlooking the water. Don’t be surprised to see local kids jumping off the ferry dock into the “refreshing” Hardanger Fjord – after all it is summer – and you were just skiing.